Productivity is the ratio of output to input. The output is goods and services. The input is labor and capital goods. These are two of the four factors of production. High productivity creates more output with less input. It's more valuable because it creates greater profit. It gives the company, industry, or country an advantage over their competitors. Businesses analyze productivity in processes, manufacturing, and sales to improve the bottom line. Governments use productivity measures to evaluate whether laws, taxes, and other policies increase or impede business growth. Central banks analyze productivity to see how well the economy is using total capacity. If productivity is low, then the economy is in recession. If capacity utilization is high, then the economy may be in danger of inflation. For these reasons, productivity growth is desired. 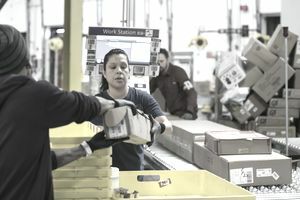 In 1994, Nobel prize-winning economist Paul Krugman noted that a country’s ability to improve its standard of living over time depends o​n its productivity. You can increase productivity by either increasing output or decreasing input. Labor Productivity = Gross Domestic Product / Hours Worked. The Bureau of Labor Statistics measures hours worked by employees, proprietors, and unpaid family workers. It also uses an index for both GDP and hours worked. Productivity was robust from the Civil War until 1973, averaging 2-3 percent. There were three growth spurts. Between 1870 and 1900, average productivity increased 2 percent a year. That was because of increased life expectancy that allowed workers to live longer. Technology, such as railroads, telegraphs, and the internal combustion engine, also helped workers produce more. During the 1920s and 1930s, productivity increased 2-3 percent annually. Innovations abounded in in electricity generation, internal combustion engines, and telecommunications. There were new petrochemicals, including fertilizers for agriculture, plastics, and pharmaceuticals. In the 1920s, productivity gains in manufacturing averaged 5 percent a year. Between 1940 and 1973, the growth spurt continued. Productivity gains were 1.5-2 percent a year as innovations spread throughout the country. Contrary to popular opinion, the World War II effort didn't improve productivity in anything other than medical care. Productivity slowed until the period 1995 through 2004. That's when it increased between 1 and 1.5 percent thanks to information technology. From 2007 to 2012, productivity averaged 1.8 percent, as workers who weren't laid off during the recession had to produce more. But most of that productivity gain has gone to the top 5 percent of companies. The most productive companies have benefited from technology that wasn't available to smaller firms. They can afford expensive robotic factories. They benefit from economies of scale offered by global markets. As a result, 95 percent of firms have seen little gains in productivity. This discrepancy in productivity has slowed the rising standard of living for most Americans. Companies not in the top 5 percent can't afford to pay their workers more. Salaries at tech behemoths like Google, Amazon, and Facebook have outpaced the whole. The 2008 financial crisis aggravated this trend. The increase in output didn't translate to an equal increase in workers' standard of living. Instead, it went to the owners of capital. Corporate profits reached an all-time high in 2013. They were 12.53 percent of GDP, up from 7 percent in 2000. Corporations got a bigger slice of output, while workers received a smaller slice. Between 2000 and 2012, the average household lost 6.6 percent in income after inflation was taken into account. The average median household income was $51,371 a year in 2012, compared to $55,030 in 2000. The Labor Department reported that real compensation only increased 0.3 percent in 2013. But by 2016, the U.S. average income levels improved enough to return to pre-recession levels. Still, income inequality in America has decreased economic mobility for those near or below the federal poverty level. As a result, higher productivity no longer leads to more jobs, as it did until 2000. Job growth has been stagnant since then. This forced workers to accept lower wages to keep their jobs. Increased automation at factories and service industries is a culprit here as well. Secretaries have been replaced by computers, bank tellers by ATMs, and bookkeepers by software. The fastest growing jobs are now in software engineering and computer support. The International Federation of Robotics estimates there are between 1.5 and 1.75 million industrial robots in operation. By 2025, it predicts as many as 6 million. Most are in the auto and electronics industries. Researchers from M.I.T. estimated that every robot cost the surrounding area 6.2 support jobs. Outsourcing forces American workers to accept lower wages or watch those jobs go to foreign workers. This leads to a lower U.S. standard of living as wages equalize. In addition, the U.S. labor force has become less competitive, adding to pressures to accept lower wages. One of the reasons that the United States is losing its competitive edge is the fact that it has fallen considerably in terms of global educational ranking. China, India, and many other emerging market countries are able to produce things more cheaply by paying lower wages. China has a lower standard of living. A low living standard means things cost less, so companies can pay less as well. A useful tool to measure and compare income levels between countries is purchasing power parity. U.S. companies are forced to offer low wages to U.S. employees if they are to compete against these companies in countries with lower living standards. If U.S. companies can't find enough low-wage, skilled workers in the United States, they have to source these jobs overseas or go out of business.